Fast_Fingers 169 3.1 History Male Domestic 2009 Accepted App completed January 15th, 2010. Accepted March 29th through email. Scholarship (20k first year, 10k the next two). MentalGopher 165 3.8 3.8 B.A., Political Science Female No AZ 2012 Accepted Money. Meh. crossingfingers 165 2.3 Philosophy Male No CA 2012 Accepted Offered 15k/1L & 10k/2L. Withdrawn. cgyoder@gmail.com 164 3.1 History Male No CA 2012 Accepted 25,000 first year only, non-renewable. Flett 163 3.1 3.1 Political Science Female Yes WA 2011 Accepted $50,000 Scholarship - $30,000 for the first year, and $20,000 for the second. WhatTheLawSchool 162 3.7 3.7 History Male No UT 2010 Accepted $15,000 for the first year only. Withdrawn. whoaamoeba 161 3.9 3.9 Spanish (Hispanic Studies) Female No TX 2009 Accepted $15,000/yr scholarship. WD. haoledugan 161 3.7 3.6 Finance Male No FL 2011 Accepted Stoked on this! 5k scholly. samaside 160 3.6 3.6 International Relations & Global Studies and Political Science Female No Domestic 2011 Waitlisted then accepted But for the grace of God! katietw95 160 3.7 3.5 Political Science Female No GA Accepted In with a decent scholarship. TylerH. 158 3.5 Political Science Male No UT 2015 Waitlisted Asked me to waitlist. 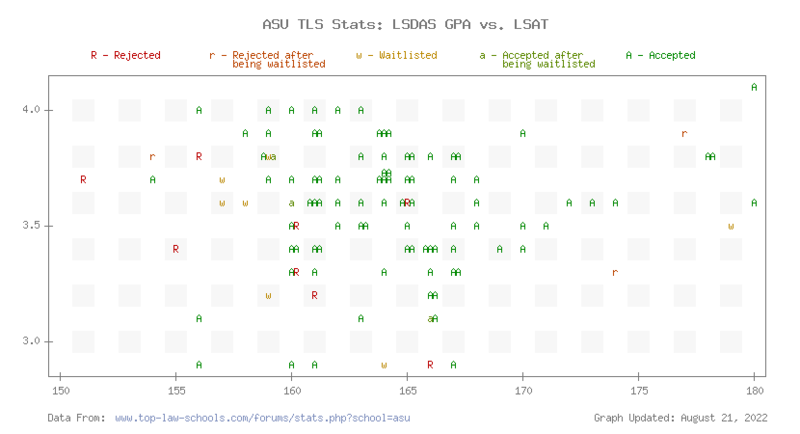 Be sure to check out the TLS Profile on ASU Law.